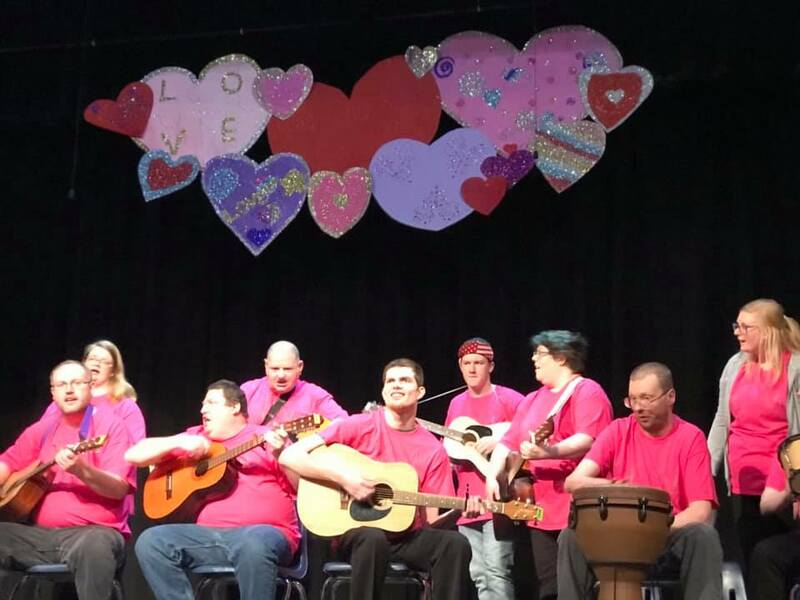 Hillcroft Services, Inc. a local provider of services for people with disabilities, hosted its 4th Annual Music Concert on March 21, 2019 at the Muncie Civic Theatre to celebrate March Disabilities Awareness Month. “Continuing the Love” was the theme of this year’s music concert which saw nearly 250 clients, staff, and community partners attend. The performances included the Sign Choir, ABA Clinic, Barrier Free Skit, Hillcroft Choir, Hillcroft Songwriting Group, Elm Street Color Guard, Hillcroft Young Guys Groups, Hillcroft Hand Chimes, Cole Academy Dancers, Hillcroft Orff Xylophones, and the Gentlemen’s Exercise Group. Many of the performances incorporated a variety of musical instruments such as guitars, drums, ukuleles, hand chimes, Orff instruments (xylophones and bass bars), maracas, tambourines, cabasas, and kokorikos. All decorations and props displayed at the concert were created by clients in Creativity Unlimited, another division of Hillcroft Services. Hillcroft Services’ Music Therapy Program hit the ground running just under five years ago. Since the inception of the program, it has flourished, and currently serves 185 clients from ages 3 to 85. “The Music Therapy Program was founded with the intent of helping our clients become more involved in the community, by means of partnerships and outreach programs. Clients have continued to express their interests in new music ideas and groups at Hillcroft. It has been our role to assist them in developing the skills needed (i.e. social, communication, daily living, etc.) to live a meaningful and fulfilling life.” said Anna Wamhoff, Music Therapy Services Coordinator. Hillcroft Services, Inc. provides residential, employment, and community support services to individuals with disabilities in several counties in East Central Indiana. The mission of Hillcroft is: “To provide innovative services and supports for People with disabilities and their families; resulting in extraordinary differences in People’s lives.” Hillcroft is focused on creating a culture of strong values, understanding the importance of ethical behavior, and maintaining high quality services to the people we serve. If you would like more information on how you can support Hillcroft Services and the Building Better Futures capital campaign, please visit https://www.hillcroft.org/contribute/ or contact Dan Wolfert at 765-284-4166 Ext. 1108 or dwolfert@hillcroft.org.